High above Battleworld floats the head of a dead Celestial, miraculously saved in the collapse of a universe. Now orbiting Battleworld as its solitary moon, Knowhere survives as a colony brimming with convicts and criminals. Yet amid this wretched hive of killers, thieves and thugs – there is hope. People who will stand and defend those within who cannot defend themselves – the Guardians of Knowhere! But mysteries abound in this head of a dead God. Suspended thousands of miles above Battleworld, a dangerous new foe stalks the alleys and corridors of this floating fortress. One who has set his crosshairs directly on the Guardians of Knowhere! Who is this new foe and what are they after? You’ll have to wait until June to find out. One thing is for certain – not everyone will walk out of Knowhere alive. 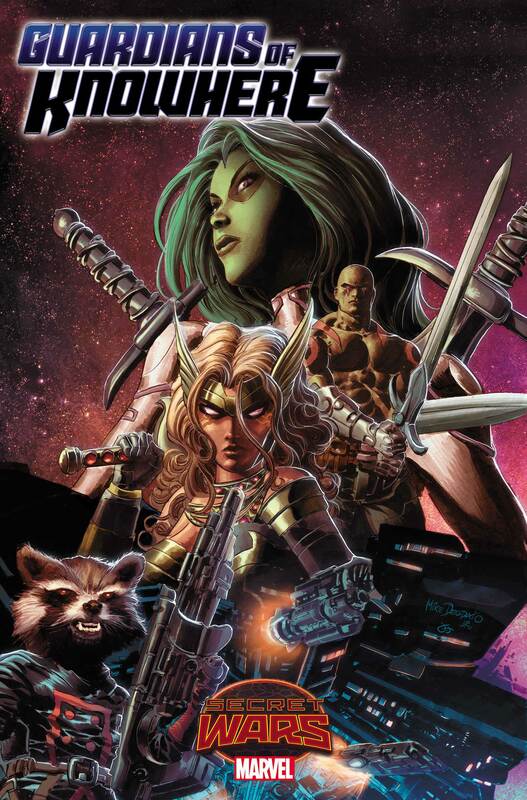 Don’t miss one moment of the pulse-pounding action when GUARDIANS OF KNOWHERE #1 comes to comic shops and digital devices this June!